Most readers will know that the suffix geo is derived from Greek, meaning the earth. It is commonly used in compound words such as geology (the study of the earth) or geochemistry (the earth's chemistry). In recent times new compounds have been invented. Geology is fundamental to all our lives, determining the nature of our soil, our rivers and the natural environment in general. The amazing geomap below shows just how much our village environment and its history has been affected by the rock under our feet. We can see graphically how different rock resistances and erosion have carved our landscape, dictated land use and settlement. Over 10,000 people in Spain take part in GeoDay events, involving excursions and field trips throughout Spain. To emulate these events, the Earth Science Education Forum is dedicating the period 5 - 13 May 2018 as a geological activity period in the UK. 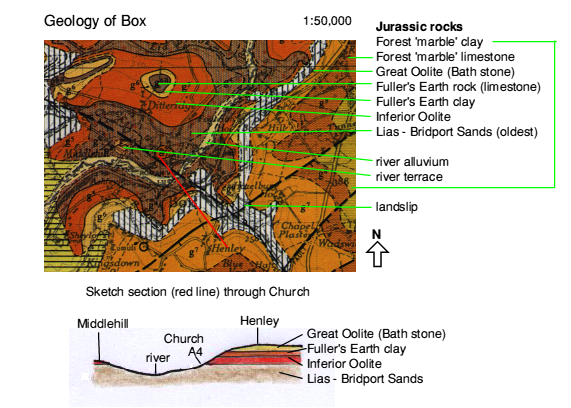 Whilst no excursions are planned for Box village, local organisations such as the Bath Geological Society are arranging several field trips throughout 2018 - see http://www.bathgeolsoc.org.uk. There is a unique geological site in our village on the Recreation Ground. 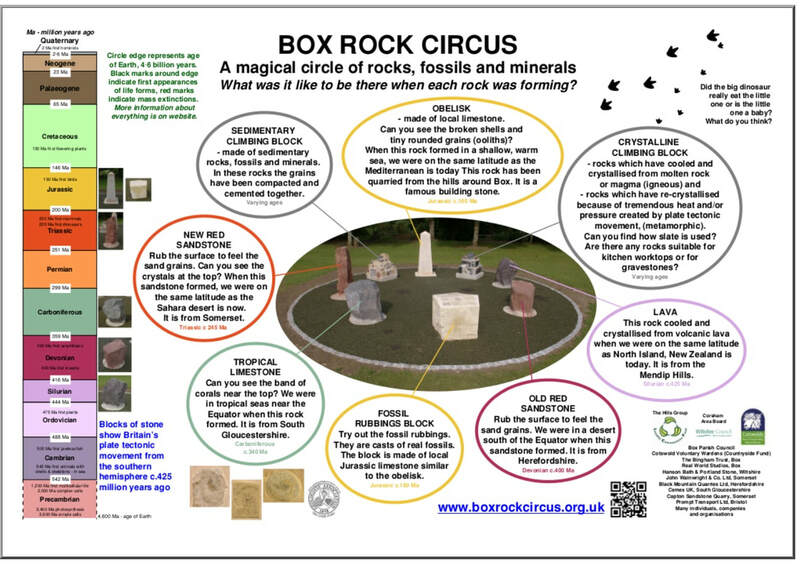 The Rock Circus, Box Rec, was built in 2012 with the aim of introducing the earth's story to children and interested adults. If you haven't explored it yet why not go in Britain's GeoWeek and be amazed at a new way of understanding the world. On the outer ring is a timeline of the earth, from its origin 4.6. billion years ago, through the age of the dinosaurs, to man's first appearance. It's a real way of understanding just how recent we are. You may like to have a go at the fossil rubbing block and take away your image of the past, or find out how Britain’s tectonic plate moved from south of the equator to its present position about 425 million years ago. What do you call a walk in the countryside searching for rare objects in obscure locations? If you are a certain age you might call it a nature ramble but others might think of it as a game of geocaching. In the game people use GPS (Global Positioning Systems on their mobile phones) to seek boxes hidden in the countryside. It's good open-air exercise and great fun. Earthcaches are found in the same way but there are containers at the sites. Cachers just answer a few geo-questions and send their answers to the cache owner. Earthcaching is a twenty-first century way of exploring the countryside and its geology in a new and exciting way. There are many Earthcaches in Wiltshire and you can discover their coordinates at https://www.geocaching.com. And, in case you are wondering about its relevance to GeoWeek, have a go at answering the questions at the Earthcache at the Rock Circus but you do have to log into the geocaching site first. Please let us know if you do it!